Charlie and the Chocolate Factory made us believe – as children – in a world where the moon is made of cheese and the planet is a goblet of chocolate. As we grew up, we realized with much sadness that the moon is rocky surface filled with craters and the world – well, it is best to not get into that grizzly details about Earth. 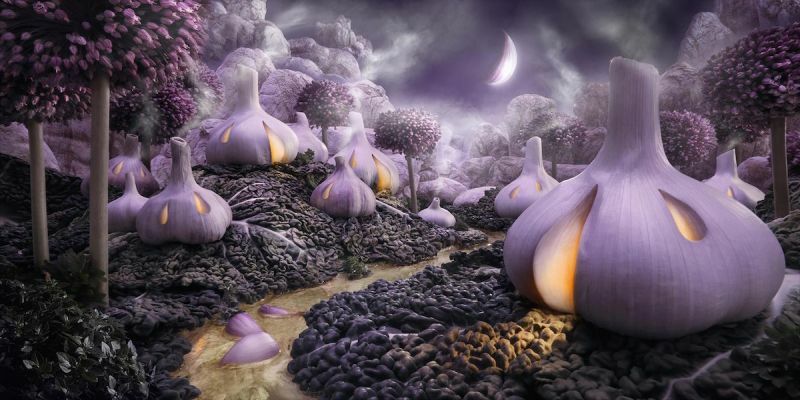 But just when you thought that the days of cheesy moon and chocolaty seas are gone forever, here comes Carl Warner – an artist who creates Foodscapes–lands of edible creations filled with exquisite and delicious food art! This article will tell you about Warner’s passion for food and photography – and how it resulted in landscapes that one can eat. It was 20 years ago, in 1998, that a Portobello mushroom inspired Carl Warner to create his first Foodscape. Warner reminisces about the day at the market when he held up a piece of mushroom into the light and imagined it as a canopy tree in an alienated and strange world. When he went home with the mushrooms, some beans, and some rice, Warner created his first piece of food art. 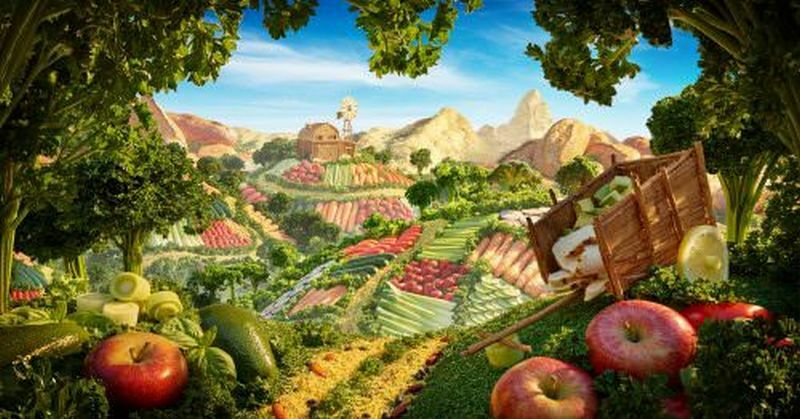 Now, in 2018, the artist has created numerous landscapes filled with food art all over the world, held exhibitions for them, and has made a successful attempt at promoting healthy food for healthy living. Warner’s Foodscapes is an epitome of humble beginnings leading to philanthropic successes. Where does Warner build his food art? Probably Warner is somewhat similar to the current generation when it comes to being homesick, so he calls a studio in London his home; and that is where the creator gives birth to his amazing edible creations. The process of building every Foodscape works like this. Warner first originally comes up with an idea of his next in the series of Foodscapes. Then, he sketches the idea on a paper. Next, he teams up with his team of food stylists and model makers to build a set. This is usually completed in 2-3 days. And viola, food turns into art, the artist turns into a photographer, and the jaws of the viewer drops at a single glance at the landscape made of food. Turns out that Warner can’t remain homesick his entire life. He has to travel around the world looking for unique markets and even unique foods. Warner consciously works with the design, color, and texture of the foods that he selects for his Foodscapes. 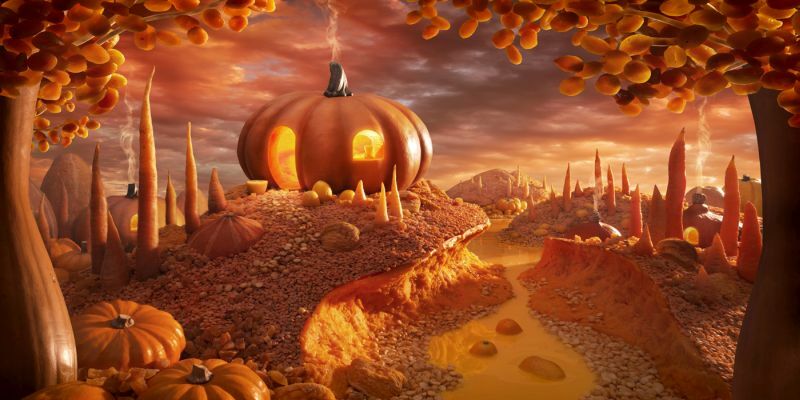 Take his Foodscape called Pumpkin Paradise, for instance.Carl Warner turns the pumpkin into a little, cute house, the pumpkin seeds turn into tree leaves and gravel. Makes one wonder if Warner can be cast as the male version of the Fairy Godmother in the next cinematic adaptation of Cinderella! To promote healthy food, Warner turned baguettes into mountains, broccoli into trees, and the rest of the colorful vegetation into small fields. This Foodscape is titled Food World Vista . Quite a way to promote green food for a greener lifestyle! What makes Foodscapes so popular? Warner’s use of colors, designs, details, and textures is the key to his success as a food artist. Warner’s food art involves familiar and unfamiliar landscapes – depending upon the requirement. But, the secret to this amazing food art lies in the way Warner captures the whole scenario in his camera lens. At the first glimpse, Warner’s Foodscapes look like any ordinary, colorful picture – but different in some unknown way from the original landscape. That difference makes you take a second glimpse. It is there that you realize the magical aspect of the picture – food. For instance, in a photograph where Warner turns the main cityscape of London into food art, he uses tomatoes, cherries, cucumbers, and coriander to portray the Big Ben, the Westminster Palace, The London Eye, and the nature around the Thames. 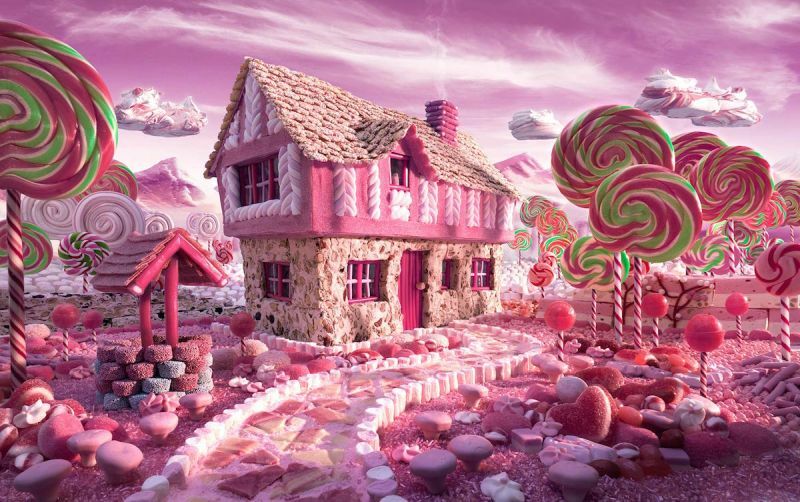 In another instance, the incredible artist uses pink candies, cotton candies, and lollipops to create a world which even a Barbie doll would envy. Warner uses his genius while combining the shades of baby pink, white, and cream to add an innocent and peaceful touch to his food art. In another one of his masterpieces, Warner turns white onions into fantasy igloos for the secret eskimos inside us. What turns this piece up a notch is his use of a slice of onion to create a calm, crescent moon. Carl Waner’sFoodscapes are right out of a beautiful dream. They are vivid, eloquent, and vibrant. From dry spaces to wet lands – Warner creates a lively picture of mysterious and familiar landscapes – with ingredients sourced from around the globe – to give his photographs a universal acclaim and appeal. Warner’s edible creations are unbelievably realistic while still retaining the fantastical touch. Human figures, mountains, rocks, stones, leaves, rivers, and snow – just name it and you will find it in the artist’s creations. Foodscapes are nothing short of a treat to the artistic eye.